When I was doing my engineering, there was a “Mandar mess” near our hostel. They used to prepare very delicious parathas. That is the place where I became a fan of parathas. I used to keenly observe them preparing it. I tried many times, after some failures, learnt how to cook alu paratha. Now I am good at making them. This is one of my many versions of alu paratha. Add water, salt to wheat flour. 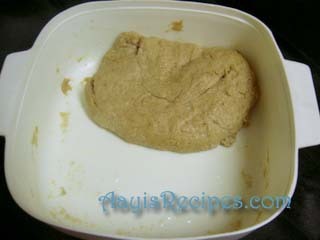 Make dough(similar to chapathi dough). Apply oil to the dough and keep for around 1hr. Cook the potatoes and mash. Make paste of coriander leaves and green chillies. Add this to potatoes. Add ginger-garlic paste and salt. 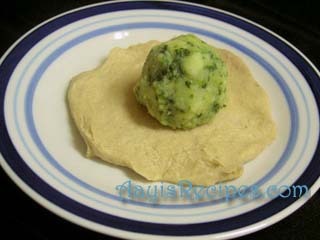 Take a small ball of dough, spread it like a puri with hand, take a ball(ping pong ball sized) of potato stuffing, keep it on the puri and close the puri over stuffing. Make paratha applying wheat flour. Fry paratha on tava, apply ghee on both sides. Serve hot. Since I have the general idea about parathas, its easier for me to understand the above preparation method. However, I feel for people who have never cooked parathas before, its not very clear. 1. What do you mean by cook potato? boil in microwave or a pressure cooker? 2. 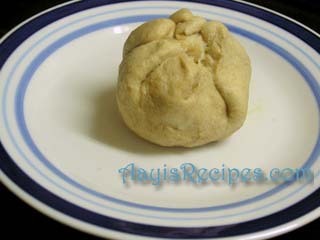 How do you stuff the potato ball into the ball of dough? Please can you elaborate on the method a bit more in detail? Ameet, Thanks for the comment. I will update this post. BTW…I felt cooking in microwave or pressure cooker will not make any difference. I have tried both. While makeing the mixture for potatos, if you add some smashed paneer to it, the parathas becomes real smooth. Thanks Shilpa for that info. I will try it next time :). Thnks for this easy and delicious recipe. This site is really wonderful. 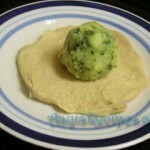 I would to know how to make dal poori. When I was in school make friends mom use to make it. I think the filling inside the poori has channa dal in it. I am not sure about it. If you know the recipe, can you post it? Before closing the puri with the aloo stuffing, sprinkle a little rice flour on the puri. This makes the paratha crispier. Shilpa : Lovely mouth-watering photographs. Thanks Sanjivani for the tip. Will try next time. Hey, i keep cooking this. thanks! one more thing, i think it’s better if the potatoes are grated instead of mashed so that any lumps which create problems while rolling can be avoided. hey shilpa – thanks a ton for this wonderfully simple and wonderfully tasty recipe . i made this last afternoon for the first time – my husband loved it . thank you – you inspire people to try out new recipes thanks to your beautiful posts . alu paratha recipe in my practicle book. I did take a chance to make Alu Paratha though not very efficient in making chapatis itself.But they turnd to be ok! Your site is lovely I enjoy cookin and these step to step instructions and mouth watering illustrations make it even more appealing.Please do post some sandwich filling ideas too. I really like aloo paratas. i just want to give everyone tips and modifications of this recipe, if u really dont mind. u have boil potaotes in cold water this will make sure that potatoes are boiled from centre to outside. and salt the water. 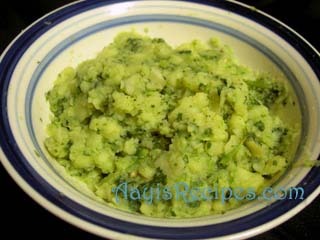 for this particular recipe i always peel potatoes chop into small pieces and little water until pieces soak in water. and if u have time grate the boiled potaotes. potatoes after boiled let them dry little , seperate them and put them on dinner plate to dry. if water is excess or potatoes are muchy, put them in fridge for 30 minutes. i always use maida and wheat flour in equal quanties. tip: to knead and make rotis always use maida instead of atta, there will not be any excess atta frying in the pan. and chop corinader leaves only finely and then add. i hope my tips might help. Hi Shilpa, as usual ur recipes are great and love them. Iam keen to know the different masalas they put in diferent stuffing , say for Alu ur add some spice, for Gobhi paratha u add different, and would appreciate if u can provide me entry with different stuffings .The way Punjabis have different masalas for different stuffing. Once again u r doing a great job Shilpa, by giving around the world recipes to us . Thanks once again. Just stumbled on this web site, great recipes will definately try it out. I loved to cook and entertain so, will add to my menu. Can I rolled out the dough and cut into segments before frying? Thank you for posting the recipe!!! Shilpa: You could cut the parathas after frying. If you cut them before, the stuffing may come out while frying. hay iam very hpy to say that the above procedure works gud…hope every one can try and njoy the taste of parata.. When I was doing my Engineer in Guwahati, I used to come to the market area and we were always earting the AaluPratha on some special occassion, like if some of us achieved some thing, as per our standard. There, the AaluParatha was very famous.The good thing was that the aalu was stuffed with good quantity, and that taste even I remeber today. I am going to make one today. So before starting it thought to get some tips online and your procedure seems to make my pratha similar to what I want, a fill potato stuffed paratha!! Will write u more as I get success! It is useful for me, thank you so much. I got confidence that without experience we can learn and do it. Hi Shilpa, I have been following your blog for quiet some time now and you an amazing cook. I myself make a variety of parathas and had a question. My stuffed parathas tend to have all the stufiing close to the corners and the center becomes hard. How to get the stuffing evely spread through out? Also, i was reading on net about layered paratha which involves making 2 separate rotis and spreading stuffing layer on 1 of roti and pressing the other roti on top followed by sealing the edges. Have you tried this sometime? 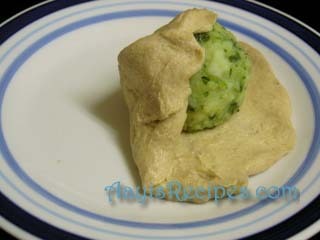 Shilpa: I have tried two rotis thing but I felt it is more difficult than stuffing, but you can give it a try. After many tries I got a perfect stuffed paratha. Iam very happy today, now i can go ahead and try all the stuffed parathas from ur blog. otherwise i had taken tips from lot of other sites to make parathas but always ended up doing “circus” (as u say 🙂 ) and then get very upset. I have a request, hav u tried bundi laddoos? if so, can u please post the recipe for it. it is one of my fav and makes me miss my native very much. Thanks!!!! Today morning i was searching for a simple alu paratha recipe..as for me its first time 2 prepare this parathas.. so i ended up trying ur recipe…it came out very well…and u know what..my husband liked it very much.. and asked me 2 make a note of the recipe in a my recipe book. Thanx 4 this easy and fast recipe. The receipe u have published is very nice and easy, i would like to share my method also. Boil aloo’s, peel and let it cool.Mash aloo, add finely copped jeera or ajwain seeds,corinder,mint leaves along with little haldi, salt and ginger-garlic paste, mix this mixture well and take half of this mixture and mix it along with the atta u are making for parathas.And make small balls of the remaining mixture, and while ur making paratha put this mixture in between and roll out, and for rolling atta use a mixture of atta,maida, and rice flour.The parathas come out evenly protioned, and crisp. 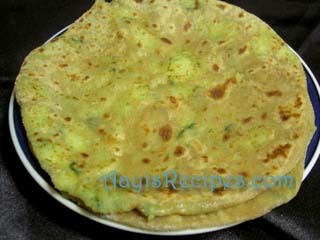 i like alu paratha very much………..but never preapred. i like to eat alu paratha very much but never tried. hey..nice mouthwatering recepie with tempting snaps.U can also try making delicious Parathas by mixing grated paneer,chopped onions,coriander,green chillipaste,fresh ginger-garlic paste,salt,a little pavbhaji masala for tht spicy flavour.Mix these ingredients and prepare yummy parathas same like aloo paratha.Just try this once.This is sure going to be treat for your taste buds! do tell me yr suggestions! Finally I could make proper alu parathas.. keeping the dough aside after applying a bit of oil is a great tip! I added some garam masala and amchur to spice it up …came out awesome. Thanks as always. Your site is a boon to newly married girls. I am from Mangalore and have tried some of your konkani recipes. These are dishes are probably prepared everyday in konkani homes but as a started i found the ingredients ‘andaaz’ confusing. Thanks to your site I am able to cook complicated Konkani dishes with ease. Thanks a lot for creating this site! I did make few changes to this recipe though.. for the stuffing i fried onion,cumin seeds, then added smashed potato garam masala and turmeric. Thanks for the tips on making the dough, even my rotis used to become hard. I’ve been trying your recipes and all of them are awesome and would like to thank you for your wonderful work..
Its an Awesome recipe but if u fry mustard seeds, jeera, green chillies, ginger-garlic paste(or ginger-garlic grated) and coriander leaves, and lil bit ajwain it will add to the flavors and it will help in digesting the alu paratha. Iâ€™ve been trying your recipes and all of them are awesome and would like to thank you for your wonderful work..
Its an Awesome recipe but if u fry mustard seeds, jeera, green chillies, ginger-garlic paste(or ginger-garlic grated) and coriander leaves, and lil bit ajwain and then add all the mixture in the mashed potatoes it will add to the flavors and it will help in digesting the alu paratha. Just stumbled upon your blog while searching for something and this caught my eye… Alu paratha from “Mandar Mess”. You studied in Belgaum by any chance? I did my BE in KLE Belgaum. Are you from Belgaum? Love your recipes, it is simply amazing! !